Does God Have Absolute Foreknowledge? Integral to understanding the subject matter set forth in this book is understanding how, “in the beginning,” God decided He would relate to human beings. Once upon an eternity, when God was all by Himself, and free to do anything He wanted, He sovereignly decided to create human beings with genuine free will. By definition, His giving them free will both limited His control of human events (but not to the point that He could not bring to pass His ultimate purposes) and also dictated a linear (“real time,” if you will) relationship between Him and them. Sad to say, this biblical truth is not what the vast majority of Christians believe, and the error they do believe adversely affects their view of God’s goodness, and thus the quality of their lives. 1) In the beginning, God determined every event in human history (the future), which He then saw as a present reality. This plan that He set up cannot play out in any other way than what He willed (theologically, this is called “Calvinism”). 2) In the beginning, God foresaw every future event of human history as a present reality. Though He did not will it to be as it would be, He knew exactly how it would play out (theologically, this is called “Arminianism”). Either of these ideas leads to the inevitable conclusions that have been drawn by countless grieving people who have suffered all manner of torturous tragedy: “Do you mean to tell me that God knew all along that (a) Lucifer would rebel and cause immeasurable human suffering, (b) Adam would turn against Him and wreak havoc on humanity, (c) my parents would be killed by a drunk driver when I was only five years old, (d) my child would be born blind, and He still went ahead with His plan??? I want no part of a God like that.” And who can blame them? No amount of so‑called “Christian” rhetoric or theological doubletalk can logically convince people or biblically prove to them why their conclusions are not valid. Only the truth of God’s Word can set them free from an erroneous perspective of Him and show them His burning love for them, and that He grieves with them even more deeply than they do, and that He longs to intervene in their lives and help them as only He can. In this article, we cannot begin to thoroughly exposit the subject of God’s foreknowledge, but we can set forth a sound synopsis of the biblical truth regarding this vital issue. As we do, we will quote from three books we highly recommend, God of the Possible and Is God To Blame?, both by Gregory A. Boyd, and The God Who Risks, by John Sanders. If every choice you’ve ever made was certain an eternity before you made it, were you really free when you made each choice? Could you have chosen differently if it was eternally certain you’d make the choice you did? If God foreknew that Adolf Hitler would send six million Jews to their deaths, why did he go ahead and create a man like that? If God is eternally certain that various individuals will end up being eternally damned, why does he go ahead and create them? And then try to get them to accept his grace throughout their lives—as though there were genuine hope for them? If the future is exhaustively settled in God’s mind, as the classical view holds, why does the Bible repeatedly describe God changing his mind? Why does Scripture describe God as expressing uncertainty about the future, being disappointed in the way things turn out, and even occasionally regretting the outcome of his own decisions? Theologically, several unsolvable problems inherent in the classical view can be avoided when one accepts that God is the God of the possible and not simply a God of eternally static certainties. Practically, a God of eternally static certainties is incapable of interacting with humans in a relevant way. The God of the possible, by contrast, is a God who can work with us to truly change what might have been into what should have been. 1. Evil and suffering must be attributed to God, as Satan is only His pawn. 2. Personal responsibility is greatly diminished, and people become fatalistic. 3. One must accept blatant contradictions of logic and intellect. 4. Biblical coherence goes out the window. 5. Prayer is basically meaningless, as it has no effect on how things turn out. 6. One’s intimate, reciprocal relationship with God is significantly diluted. God sovereignly enters into a relationship that involves risks for both God and His creatures. The almighty God created significant others with freedom, and grants them space to be alongside Him and to collaborate with Him. God expects this collaboration to proceed toward the fulfillment of His goal for creation. God loves us, provides for us, and desires our trust and love in return. We see this most fundamentally demonstrated in the life of Jesus, who came not to dominate others but to reconcile rebellious creatures by the power of love. God freely chooses to be affected by His creatures—there is contingency in God’s relation with creation. Moreover, God is the sovereign determiner of the sort of sovereignty He will exercise. God is free to sovereignly decide not to determine everything that happens in history. He does not have to because He is supremely wise, endlessly resourceful, majorly creative, and omni-competent in seeking to fulfill His project. In the God‑human relationship, God sometimes decides alone what will happen; and other times God modifies His plans in order to accommodate the choices, actions, and desires of His creatures. Scripture shows that when Adam exercised his free will to disobey God and buy into the Devil’s lies, he transferred his God‑given legal dominion of the world to this fallen angel. Satan says just that when he is tempting Jesus to worship him in exchange for rulership over all the kingdoms of the world: “…I will give you all their authority and splendor, for it has been given to me, and I can give it to anyone I want to (Luke 4:6). God sent His only begotten Son to take back this dominion, but, in contrast to Satan’s offer of a “free pass,” Jesus had to endure the horror of the Cross in order to do so. When he walked the earth, Jesus showed us how to access God’s intervening power to make things different here on earth. When Jesus came upon situations like the man born blind (John 9), his exhortation was, “Don’t just stand there; do something!” Prevailing theology in the Church today leads to resignation, just the opposite of Jesus, who found such tragic situations revolting, and who thus was all about revolution! Not only are we to pray that “…your will be done on earth as it is in heaven,” but we are also to act in obedience to His Word so He can exercise His power in Satan’s worldly realm. It is not at all true that “God can do anything He wants to do.” The reason God cannot do certain things now is because of what He chose to do once upon a time: create free will beings. How do we know that? Because God’s will is clearly stated in His Word: He wants (wills) to stop all evil, heal everyone, deliver everyone, bless everyone, and give everyone everlasting life. If He could do those things now, He would. But He can’t—not without sufficient human cooperation. For example, how did God stop Goliath? Only with the cooperation of a young man named David, who chose to act in concert with God to interrupt wickedness (cp. Ezek. 22:30 and 31). As we saw in Chapter 7 [of our book, Don’t Blame God], God is not actively judging and punishing people now, but he will. One day, according to God’s direction, the Lord Jesus will destroy Satan, all demons, and all wicked people, and finally restore the Paradise God intended for mankind. (11) But the angel of the LORD called out to him from heaven, “Abraham! Abraham!” “Here I am,” he replied. The word “now” is a time word, and clearly shows that up until that second, God did not absolutely know what Abraham would do. How Does God Have Foreknowledge? Please do not hear us saying that God does not have foreknowledge, because He most certainly does. What He does not have is ABSOLUTE foreknowledge, in the Hellenistic sense expressed in both the Calvinist and Arminian ideas above. 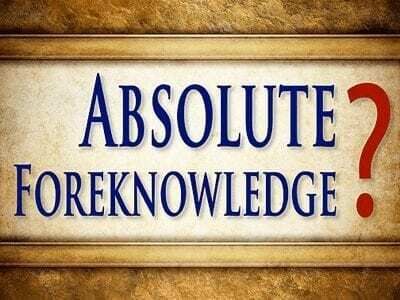 What is foreknowledge? It is a combination of knowledge, wisdom, experience, vision, and intuition. Many Christians say that God is “omniscient,” which means that He knows all. Yes, He does. The issue is not about God’s ability to know, but about what is available for Him to know. The question is whether the yet unmade choices of free will people are absolutely knowable, and we believe the Word says they are not. So the question is really about the nature of the future, and we assert that the Word of God shows that the future is comprised of both settled certainties (what God can and does absolutely know will happen) and unsettled possibilities (what human beings will determine by their choices as they relate to Him). One is not ascribing ignorance to God by insisting that he doesn’t foreknow future free actions if indeed free actions do not exist to be known until free agents create them…. Those who oppose the open view of God on the grounds that it compromises God’s omniscience are simply misguided. How does God have foreknowledge? Just like you have foreknowledge. And you’re saying, “What? !” Sure you do. Let’s say you have an eight year old child, and we set before him a plate of brownies and a plate of broccoli. We then ask you to demonstrate your foreknowledge by telling us which plate he will choose. You can do so because of your knowledge of the past and the present life of your child, even though in reality your knowledge is quite limited because you cannot read your child’s mind, nor do you know everything he has ever done. Now think about how GOD sees people. He has perfect and complete knowledge of the past and the present, including the DNA of every fetus and the thoughts of every human and every demon. He also knows His own purposes and abilities. With all that in mind, He makes two kinds of predictions/prophecies/promises: conditional and unconditional. Conditional promises relate to unsettled possibilities, as in: “If you do this, I’ll do that.” A prime example of this is the Mosaic Covenant. Unconditional promises relate to settled certainties, as in: “I’m going to do this, no matter what you do.” A prime example of this is the Abrahamic Covenant. In the case of Abraham and Isaac, God knew Abraham’s heart, and all his thoughts. He knew that Abraham loved Him, and He had seen his faithful obedience. Though God could not be absolutely sure what Abraham’s free will choice would be until the second he made it, He was virtually certain what Abraham would do. How Did We Get in the Theological Soup? For two millennia the Neoplatonic philosophical understanding of God (which begins with a particular understanding of “perfection”) has been brought together with the biblical portrait of God and evolved through history into one grand “biblical‑classical synthesis…This resulted in a radical displacement of the Old Testament understanding of God as a personal being involved in a relationship of “steadfast love” (hesed) with His creation… The classical doctrine of the divine essence was sometimes abstracted from the divine project and made a subject unto itself; thus “God” was analyzed as a non‑relational concept. That is, the nature of God was divorced from the relationship in which God created us, and God was defined in terms of utter transcendence, immutability and power apart from the project [mankind] God initiated and carries on. Consequently, the attributes of omniscience and omnipotence…often acquired meanings that they need not have. Such terms may be used, but they must be defined in light of the biblical understanding of the divine wisdom, love, holiness, and faithfulness. Divine immutability, omnipotence, and so on… were often defined in terms of Plato’s understanding of perfection—that which could never change, since any change would only be for the worse. Western theology has had a difficult time placing “God is love” at center stage when discussing the divine attributes. Instead, it emphasizes the more abstract and impersonal attributes of omnipotence and omniscience. In my opinion, this results from the failure to place the discussion of the divine nature under the category of a personal God carrying out a project. Despite its claim that God is a personal being, Western thought has paid insufficient attention to the specific sort of world God decided to create—a world in which God enters into reciprocal interpersonal relationships. As we stated in Chapter 3 [of our book, Don’t Blame God], JESUS CHRIST is “…the image of the invisible God…” (Col. 1:15 ) and “…the exact representation of his being…” (Heb. 1:3). If ever we read anything in the Old Testament that seems to make it look as if God is acting contradictory to His loving nature, or if ever we experience anything that makes us doubt His love, we ask ourselves: “Can I picture Jesus doing that to me?” If the answer is No, then God didn’t do it. An indispensable rule of thumb is as follows: We never abandon what we know from the Word in the face of what we do not understand experientially. “The word foreknowledge occurs seven times in the New Testament (the verb proginosko in Acts 26:5; Rom. 8:29, 11:2; 1 Pet. 1:20; 2 Pet. 3:17; the noun prognosis in Acts 2:23; 1 Pet. 1:2). Five times it is used for divine knowing in advance, and twice it refers to humans having foreknowledge. Obviously, if the term is applied to humans, then the mere use of the word foreknowledge does not settle our dispute…When God is said to have foreknowledge, the object of the divine foreknowledge is either Jesus Christ or the people of God (as a group). Hence God “foreknows” [Jesus] as well as his decision to elect a people of God. Neither of these requires exhaustive foreknowledge of future contingencies, only knowledge of what God chooses to do. God can and does predetermine and foreknow whatever he wants to about the future. Indeed, God is so confident in his sovereignty that he does not need to micromanage everything. He could if he wanted to, but this would demean his sovereignty. So he chooses to leave some of the future open to possibilities, allowing them to be resolved by free agents. It takes a greater God to steer a world populated with free agents than it does to steer a world of preprogrammed automatons. Because of God’s self‑revelation in Jesus Christ, we can be confident of our knowledge about God’s character and general purposes for our life. What we can hardly fathom, however, is the vast complexity of [this fallen] creation, a creation that includes an untold number of human and spiritual free agents whose decisions affect much that comes to pass…Behind every particular event in history lies an impenetrably vast matrix of interlocking free decision [sic “decisions”] made by humans and angels. We experience life as largely arbitrary because we can’t fathom the causal chains that lie behind every particular event. In Christ, God’s character and purposes are not mysterious, but the vast complexity of causal chains is. The mystery of evil, therefore, is about an unfathomably complex and war‑torn creation, not about God’s character and purposes expressed in creation. We might think of the overall state of the cosmos at any given moment as the total pattern of ripples made by a constant stream of rocks thrown into a pond. Each ripple interacts with other ripples, creating interference patterns…Each person influences history by using his or her morally responsible say‑so, creating ripples that affect other agents…In this sense every event is an interference pattern of converging ripples extending back to Adam, and each decision we make influences the overall interference pattern that influences subsequent individuals. From this it should be clear that to explain in any exhaustive sense why a particular event took place just the way it did, we would have to know the entire history of the universe. Had any agent, human or angelic, made a different decision, the world would be a slightly different—or perhaps significantly different—place. But we, of course, can never know more than an infinitesimally small fraction of these previous decisions, let alone why these agents chose the way they did. Add to this our massive ignorance of most natural events in history—which also create their own ripples—and we begin to see why we experience life as mostly ambiguous and highly arbitrary. We don’t know and can’t know why particular harmful events unfold exactly as they do. What we can know, however, is why we can’t know: it’s not because God’s plan or character is mysterious but because we are finite humans in an incomprehensibly vast creation that is afflicted by forces of chaos. The mystery of the particularity of evil, which is no different than the mystery of the particularity of everything, is located in the mystery of creation, not the mystery of God. And given this mystery, we must refrain from blaming each other or blaming God when misfortunes arise. Rather, following the example of Jesus, we must simply ask, What can we do in response to the evil we encounter? When we compromise what we do know (God revealed in Jesus Christ) because we forget what we don’t know (the complex creation)—when we make the mystery of evil a mystery about God rather than creation—we tarnish God’s character and indict victims of the war [as Job’s “miserable comforters” did]…A healthier perspective, one which honors God’s character revealed in Christ and refrains from indicting people, acknowledges ambiguity and warfare up front. We must with confidence anchor ourselves in what we can know—that God looks like Jesus—and simply confess ignorance about everything else. If we are going to blame anyone, the book of Job and the ministry of Jesus would have it be Leviathan, Behemoth, hostile cosmic waters or (what comes to the same thing) the Devil. Though we can’t know the “why” of any particular instance of suffering, we can and must know that our whole environment is under siege by forces that hate God and all that is good. By our own rebellion we are caught in the crossfire of a cosmic wear and we suffer accordingly. (26) to the pure you show yourself pure, but to the crooked you show yourself shrewd. (27) You save the humble but bring low those whose eyes are haughty. By creating people with genuine free will, God limited the extent to which He can control what happens on earth. That is why Jesus said to pray that the will of God be done on earth, as it is in heaven. Clearly, he would not have said that if everything that happens on earth is the will of God. In fact, most of what happens is because of the will of man, and is not at all what God wants. Think about this: because you have free will, you, a human being, can limit GOD, the Creator of the heavens and the earth. What pleases someone who is love, that is, whose only desire is to do all He can for us? The answer is being able to do so. If a wife worked all day cooking a fabulous dinner for her husband to show him how much she loves him, how disappointed would she be if he didn’t even come home to eat it? The Devil knows that unless we understand that God is an abundant rewarder, we will not diligently seek Him, and that is why he has sown so much error among mankind about God’s loving character. During his earthly ministry, Jesus experienced the same kind of limit being put upon what he could do for people. He was certainly both willing and able, but when those who heard his message failed to believe it, he could not help them. In closing this article, and recognizing that Jesus Christ is our supreme example of how to relate to our heavenly Father, let us exposit a truth about Jesus that has apparently escaped most Christians through the centuries. If it is challenging for you to grasp, consider it in the light of all you have read so far in this article. Who made the promises to the patriarchs of Israel—Abraham, Isaac, and Jacob? God did. This verse says that it is only Jesus who can make those promises come true. Given that Jesus was “the last Adam” (1 Cor. 15:45), he had to have had genuine free will just like the First Adam did. That means he could have chosen, as Adam did, to turn away from God and the destiny set before him. If Jesus chose to confirm the promises of God, he could have also chosen to nullify those promises. That makes sense, but what about all the prophecies stating what the Messiah/Savior would do, especially those in Isaiah 52 and 53 about his going through terrible torture and laying down his life on the Cross? The only way to look at them without biblical contradiction is to see that God was giving him a good reputation to live up to. Yes, because Jesus did not have to fulfill those prophecies. He could have quit on God just like the First Adam once did in a garden. Jesus could have bailed out in the Garden of Gethsemane or during his unspeakable agony on the Cross. He could have called upon God’s angels to save him, just as he said. But he did not. Instead, he reached to the depths of his soul, where he had hidden God’s faithful Word, and chose to stand in the gap for all mankind. His love for God, and for people, carried him through the agony, all the way to his last breath, “It is finished.” Until that moment, the everlasting purposes of God were hanging in the balance, but when Jesus finally gave up his life, it was “all over but the shouting,” as the saying goes. Inexorably, Satan’s doom and the believers’ ultimate victory is drawing ever closer, and the shouting will be by those of us who chose to make Jesus our Lord. More than anyone who has ever lived, Jesus realized that his choices were critical, not only to his own life, but to all mankind. He understood that in order to enjoy the glorious blessings of living forever in Paradise with the family of God, he had to first endure the torturous suffering of the Cross. His was the most precise walk with God, with no missteps. Jesus was always in the right place at the right time to say or do the right thing to or for the right person. So can you, and each of your kairos moments for the Lord will become “Kodak moments” at the Judgment Seat of Christ when the pictorial of your life is displayed. Just as Jesus trusted God’s promises to him, you can trust His promises to you and see His hand upon your life. (9) Let us not become weary in doing good, for at the proper time [kairos] we will reap a harvest if we do not give up. (10) Therefore, as we have opportunity [kairos], let us do good to all people, especially to those who belong to the family of believers. (16) making the most of every opportunity [kairos], because the days are evil. How God must have longed for the moment of Christ’s birth, and the moment he began his earthly ministry, and the moment He raised him from the dead, for it was Jesus who explicitly made known God’s burning love for people and His hatred for evil. Rather than trusting in a static, pre‑determined “plan,” we can trust in the living God, our Father, and in our Lord Jesus, who walk with us in the trenches of life and work closely with us in every aspect of our lives, always fighting for the best for us. Truly we do have a magnificent Lord and a great big wonderful God! Editor’s note: This article was taken from our new Sixth Edition of Don’t Blame God! A Biblical Answer to the Problem of Evil, Sin, and Suffering. This is the new Chapter 8, and there are also some other additions and changes in this edition, particularly in Chapters 3 and 11 [formerly Chapter 10]. We encourage you to order this new Sixth Edition so you can add to your knowledge of this critical topic.